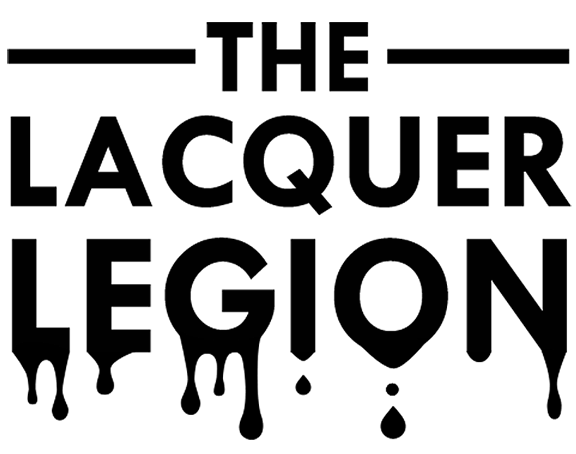 The school semester is finally over and it is time to get glam with the Lacquer Legion! And not a moment too soon. I've actually had a hard time even finding the energy to paint my nails at all this month so it was nice to have a reason to sit down and treat myself to a beautiful polish! Great minds think alike, and once again my soul sista Chalkboard Nails and I have come up with the same idea... And because I am headed to work in just a half an hour, I had no time to rethink my plan and do something else. Plus I really wanted this polish on my nails. It's been untried for far too long. And I did an accent nail, so it's different, right? And I know you won't complain about seeing this beauty twice. I swapped for this polish so long ago and was so excited to wear it, but just didn't! Why do we all do that so often? It makes no sense. This is three coats of the polish alone, but two probably could have done the trick if I wasn't going to be photographing it. I also wanted to do a full-on rhinestone nail like I see all over Instagram from the best nail techs, but sadly I don't have any Swarovski rhinestones so this nail is decidedly lackluster compared to my rhinestone dreams. I used nail glue to stick these suckers on though so hopefully it will last for a couple days! Glamor can mean so many different things for different people and I am so excited to see what everyone participating comes up with! I hope you guys liked this mani, and don't forget to share yours on our Facebook page, or anywhere on social media with the tag #LLglam. :) Glamour with bling :) lovely idea!